FAQ: What does UX Mean and Why Is It Important? So let’s start with what UX is. UX stands for user experience. Basically, it refers to how a person feels about using a certain product or service and their perceptions of how easy and efficient it is to use. Why is this important? Well, if a consumer is not satisfied with the way your website or app runs then they may not purchase from you or be a repeat customer. -We focus on a strategy to give the design purpose and direction. We use constructive design consultation and brand analysis. We also review objectives so that together we can achieve amazing results. -As a team we make sure the bar is raised for user interface design. It is the backbone of the user experience, so it is super important. At Cyberbility we are able to deliver the best outcomes with our interface design. 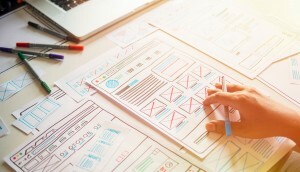 -A wireframe is the blueprint of a website. We use this to purposefully arrange elements for the best experience possible. This helps provide clarity and direction to the design. -We design text that wants to be read. The content on your website is important so we make sure the design showcases the text in the best way. -We research competitors to give you a comprehensive understanding of what they’re doing to be successful. -We enjoy challenging our minds to be creative and think of new things every day. This allows us to give each and every client a truly unique result. Give us a call today to see how we can improve your UX!